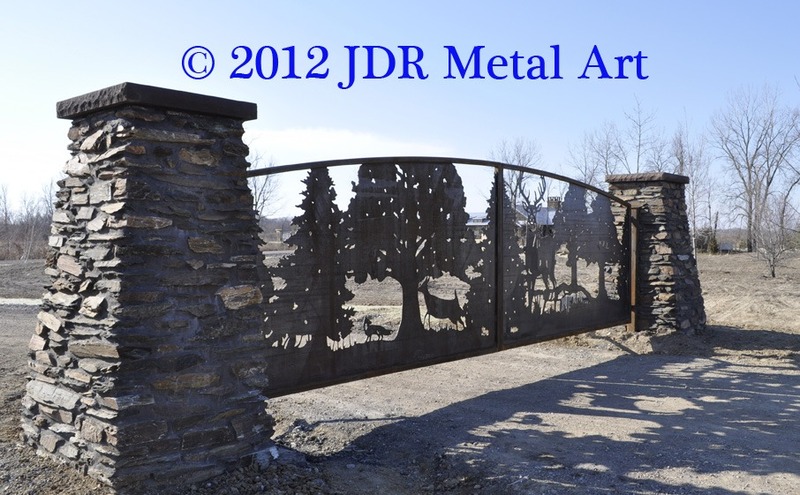 Wildlife Driveway Gates for Farms, Ranches & Residences - Custom Driveway Gates - Iron Steel & Aluminum - JDR Metal Art - FREE Standard Shipping! Custom Made for Hunting Properties, Farms, Ranches, Animal Preserves and Sanctuaries, and Lovers of the Wild & Great Outdoors. 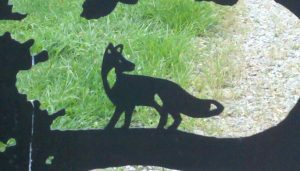 Our wildlife driveway gates & designs are artistic and creatively made to look as real as possible. 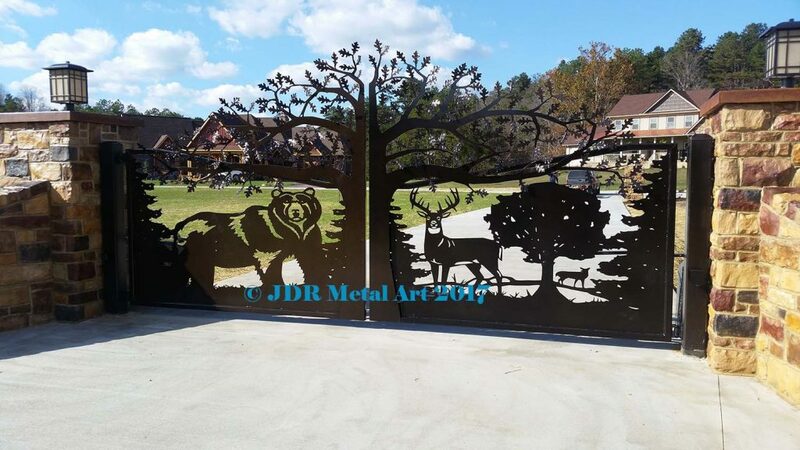 Our nature scenes feature a practically unlimited variety of different animals and wildlife such as whitetail & mule deer, elk, moose, bears, foxes, ducks, birds, turkeys, pheasants, hogs, alligators and practically anything else you could want on your gate! Our decorative driveway gates are plasma cut and constructed by hand, making each one unique and original. This is one of our most popular driveway gates. It’s a single panel swing entry gate that measures 11′ wide and 6′ tall. This particular gate is hung to swing in toward the property from hinge brackets which are bolted to the backside of the upright timbers. We typically supply a steel post from which to hang the gate. This design features a large whitetail buck standing proudly in the grass out in front of some trees, along with a fox and a turkey in the background. The gate frame is crafted from steel square tubing. 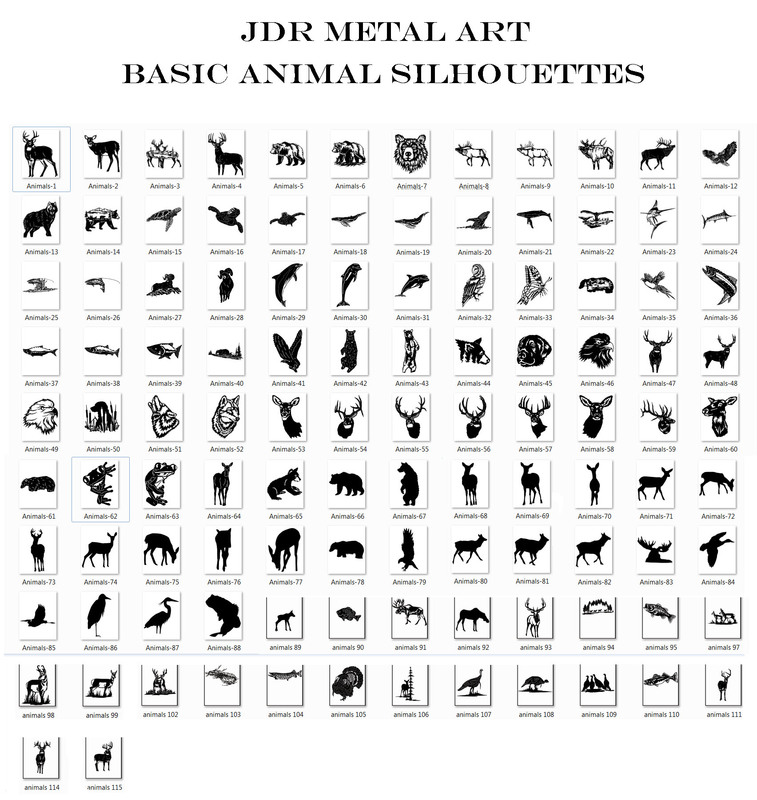 The metal silhouette is cut from 1/8″ sheet steel. Weighs approximately 250 lbs. Gate is located off a quite back country road between Cincinnati and Columbus, Ohio. This dual swing metal art entrance gate is automated with a Liftmaster LA 412 solar powered gate opener. It features a whitetail buck and doe and was installed in north central Ohio. Each gate panel is 10′ wide x 6′ tall. 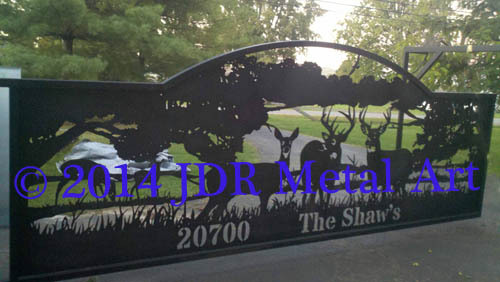 This dual swing driveway gate is plasma cut from steel and features a hunting design theme. Each panel is 9′ wide and 6′ tall. This is a 16′ wide dual swing gate with an assortment of different swamp creatures: a buck, doe and a fawn. Also, five ducks, a turkey and three alligators. Add to that some cat tails, grass and cypress trees. 1/8″ sheet steel silhouettes were each plasma cut and then welded into heavy duty 2″ square tubing frame with heavy duty hinges. This Louisiana driveway gate design has proven to be quite popular in the short time since we first designed it in 2017..it’s been modified to fit several other properties across the Gulf Coast and Atlantic Florida. 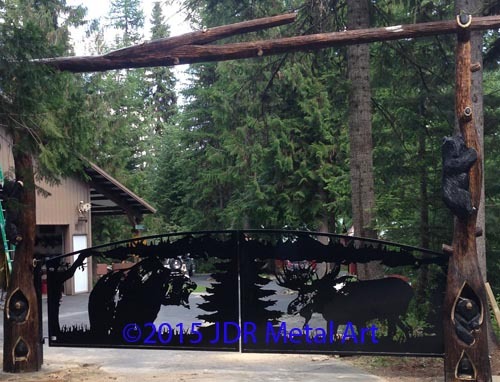 18′ dual swing gate designed for Kentucky residence, installed by JDR Metal Art. 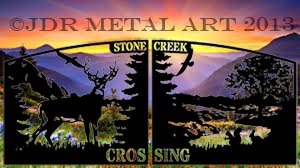 Large 20′ single slide gate panel, metal art design with deer, turkeys, ducks and cypress trees. Designed for a hunting preserve outside Tallahassee, Florida. 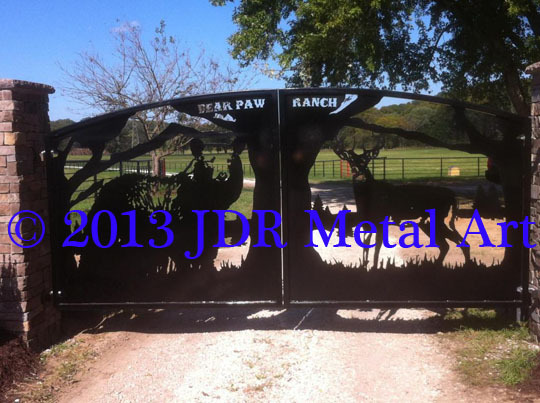 This is a 20′ wide dual swing gate with four whitetail deer (a buck, a doe and two fawns). There is also a groundhog, two bunnies and a squirrel. Gate was delivered to clients in the Smokey Mountains. 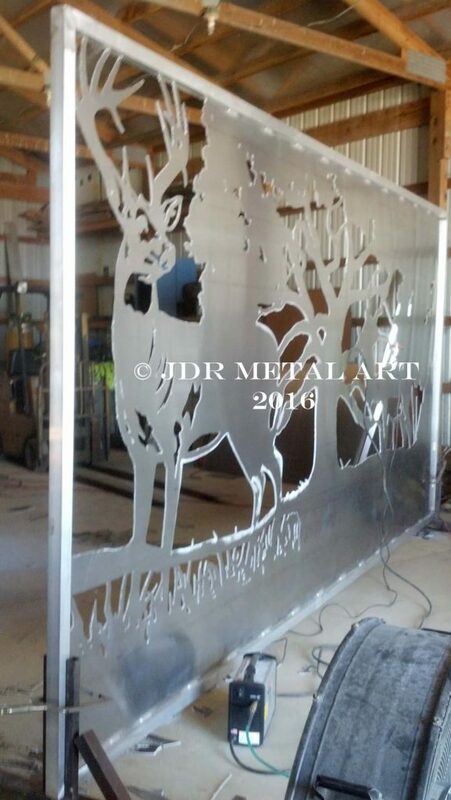 This is one of our favorite deer gates, each panel is 6′ wide x 6′ tall: 12′ total width. The whitetail buck and doe are accompanied by turkeys on the left side gate panel. This ornamental wildlife entry gate is one of our favorite pieces built to date. At 18′ long, there is an additional 12′ structure on the end (not visible here) to turn it into a sliding gate. Features two whitetail bucks, a doe and two fawns in a Missouri woodland setting. 16′ single swing gates, each of them a whopping 8′ tall. We built three of them for a client near Orlando, Florida. Scene includes silhouettes of Antelope, Deer and Turkeys. More photos and details of the Cypress Ridge hunting preserve driveway gates at our drive gate blog. Custom built for a lodge in upstate New York. This is a powder coated 11′ single swing steel driveway entrance gate. 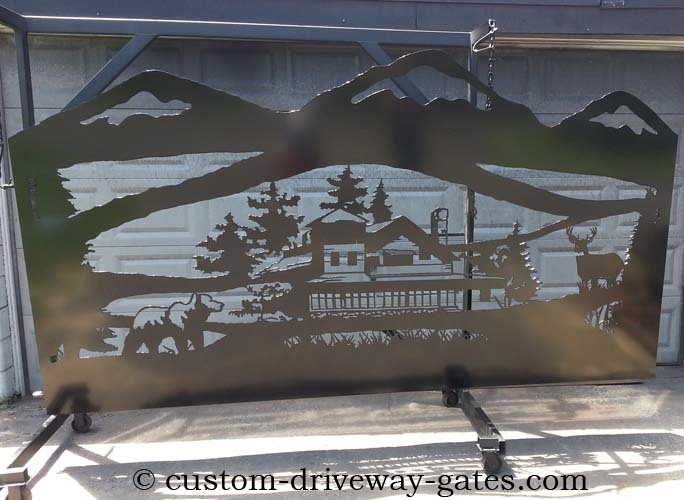 Plasma cut from rugged 3/16″ sheet metal, the gate design features a lodge in the mountains with wildlife, two bears and a deer, grass, mountains and tree accents. Oklahoma driveway gate featuring steel elk & turkeys design for Three Wild Turkeys elk farm a short drive north of Oklahoma City. One of three shown. 6×6 steel posts with matching black powder coat finish. 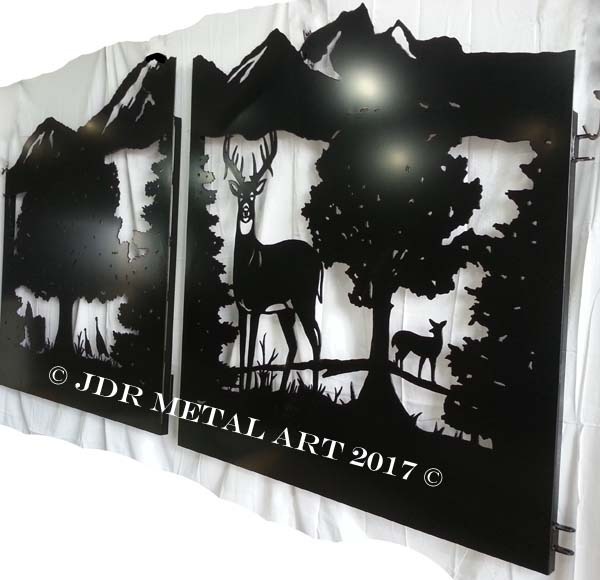 Plasma cut design with moose & bear silhouettes. 22′ wide dual swing. 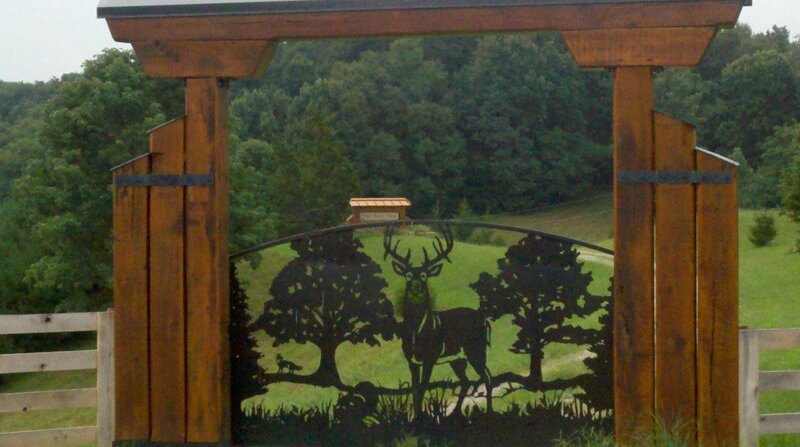 This one is a 16′ whitetail deer style swing gate that was put together and installed outside of Cincinnati in southern Ohio. Automatic opener system installed. 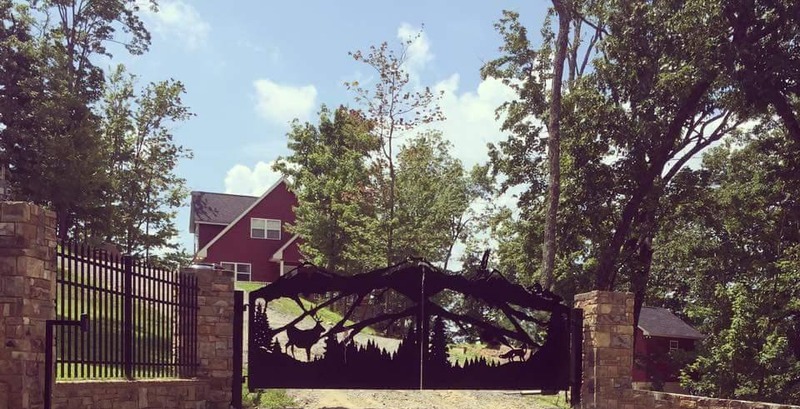 This front entry gate was made for a farm in West Virginia. They installed it themselves and did a fantastic job. One of the first sets of powder coated gates after building the powder coat oven in 2014. This 20′ dual swing deer gate was designed to rust to a fine purple patina. Mounted to local stone columns, it is made from Corten weathering steel and will develop a beautiful rust patina over time until eventually the rust achieves its final look; a slightly purple-hued rustic finish that seals itself off from further rusting. We installed these dual swing gates at a private hunting reserve in Cuba, Illinois. For openers to install Apollo model 3500/3600 driveway gate openers along with an automatic exit wand and a wireless intercom/keypad system. The weather was uncooperative with lots of rain, high wind, and then snow but we survived and this picture was taken and sent to us the next spring by Jeff Martin, landscape architect for this project which now features native prairie grass and wildflowers along each side of the driveway. 19′ dual swing entrance gates we built for Louisiana estate entryway. 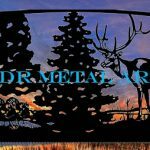 Featuring whitetail deer, hog, ducks, & trees along with custom lettering. Built from rugged 1/8″ thick steel. Shown cooling down here after we pulled them out of the powder coat oven. 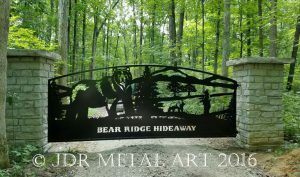 The bear depicted on these plasma cut ranch gates happens to be “Gentle Ben” of TV fame in the 1960’s…now memorialized in steel making up the driveway gate at Bear Paw Ranch in St. James, Missouri where Gentle Ben was born and raised. The gate was custom designed and fabricated for the gentleman who now owns the ranch. Our client’s son’s wedding was coming up soon and the project was time critical. We were able to get the gate delivered to him to be installed with a couple days to spare before the wedding. A whitetail deer is featured on the other half of the gate. A truly one-of-a-kind design with all design rights privately held by gate owner. 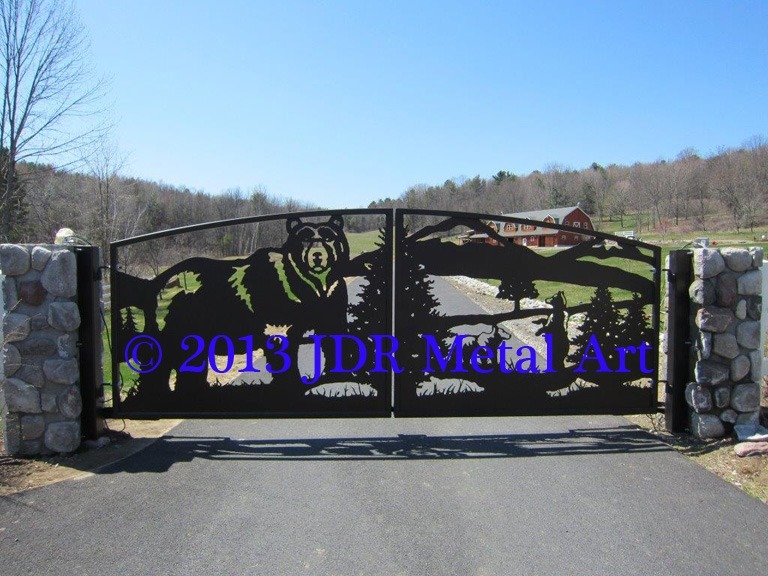 This 16′ bear-themed entry gate was built for a fun couple who spend their time between Florida and their family farm, the Mountain View Estate, in the beautiful Adirondacks in upstate New York. We had the gates powder coated with zinc rich primer for corrosion control with a flat bronze topcoat. We delivered the gates from Columbus, Ohio to New York and installed them there along with an Estate Swing 1000D automatic opener package. This steel gate was plasma cut from 1/8″ sheet and mounted to a stone column. We built an F shaped bracket from square tubing which was embedded inside the column. The hinges mount to the tubing that protrudes from the wall about 4′ apart. The gate weighs approximately 450 lbs. 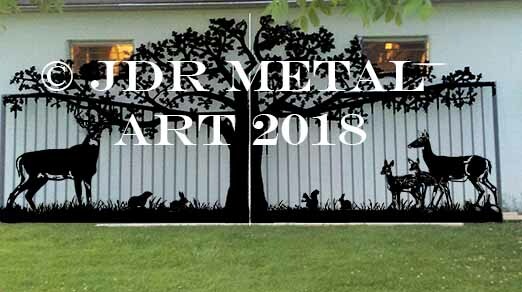 A detailed driveway gate with custom lettering, whitetail deer, pheasant, pine trees, flying birds, squirrels, rabbits, day lilies and an English Springer Spaniel. Total width including the side panels is 28′. 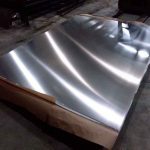 All our work is hand cut with a Hypertherm plasma cutter. If you have a theme in mind we can design a gate that will be meet or exceed all your expectations. If you are able to provide us with a picture of your entrance then we can actually show you what the gate will look like before the first cut is ever made. You can also check out our ornamental tree gates here & horse gates here. If you are interested in having us create a custom design for you or have any other questions then feel free to contact us below. 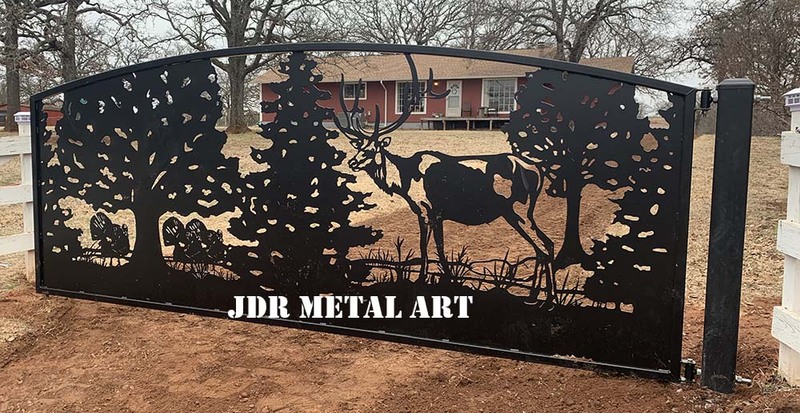 Thank you for taking the time to look at some of the unique driveway gates we’ve enjoyed putting together here at JDR Metal Art. Most customers typically choose steel construction for their gate. We also build them from aluminum whenever the situation calls for it. Whether steel or aluminum best meets your needs, they can be made to custom fit your driveway no matter the size. Another issue is that video games are typically serious naturally with the key focus on mastering rather than fun. Although, there’s an entertainment part to keep your sons or daughters engaged, each game is normally designed to work towards a specific expertise or program, such as mathematics or technology. Thanks for your write-up. Just commenting to show my support. Your post is well put together Good job!